for my family, fall is a big time of entertaining. there is a lot of football to be watched, and with the weather getting cooler, we have a tendency to often gather with friends to eat, play games outside, and then retire to the fire pit for s’mores. while i am cooking and guests are still arriving, i like to set out a little something for guests to snack on, and this is one of my favorites to put out. most people love nuts and this is a deliciously different way to serve them, instead of just plain ol’ poured-from-the-can-mixed-nuts. they are a little bit sweet and a little bit spicy. and the rosemary gives it an incredible flavor. if you and your guests don’t polish off the whole bowl in one night, they will keep for about 2 weeks in an airtight container. 2. spread out nuts in a single layer on a rimmed cookie sheet. roast for about 8-10 minutes, stopping about halfway through to stir the nuts a bit. 3. while the nuts are roasting, in a small saucepan over medium-low heat, melt the butter. once completely melted, add in chopped rosemary, cayenne, and brown sugar. whisk well to incorporate. turn off the heat. 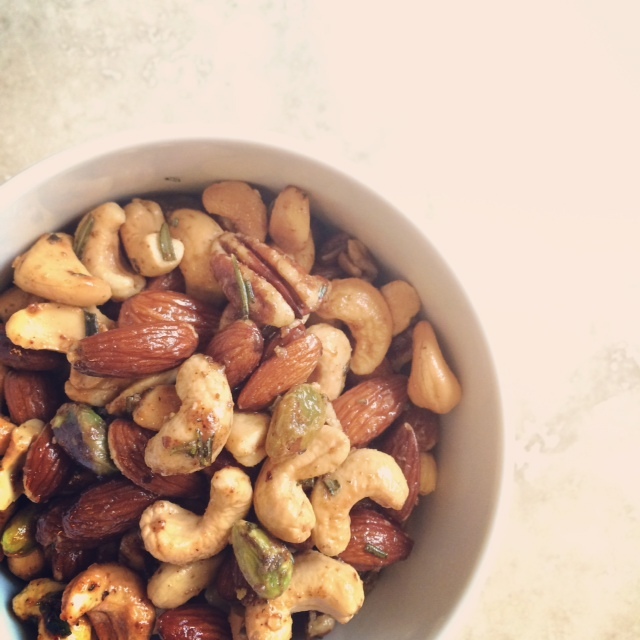 4. when the nuts are done roasting, pour them into a large bowl. toss well with the butter mixture. serve while still warm or at room temperature. well, one fine day i experienced a kale salad that i fell in LOVE with. i actually went around telling people about this salad, making them promise me that they would go as fast as they could to go get this amazing salad. KALE salad. if you know me, this would have seemed odd. but it’s true. this kale salad is amazing. and anyone who has been to h.e.b. or central market in texas and tried this salad can attest to this. i had a little help (from this blog and this blog) to get the ingredients straight and then i adapted it, getting it just right to my taste. hope this makes you like kale too. *if you are wanting to make this recipe whole30 friendly, just sub coconut aminos for the soy sauce, omit the agave, and make sure there is no added sugar in your OJ. 1. after washing (and drying off a little) & chopping, place kale in a serving bowl or glass dish. 2. in a mason jar, combine orange juice, rice wine vinegar, soy sauce, sesame oil, agave, and ground ginger and give it a good shake (or you can whisk it all together in a small bowl). 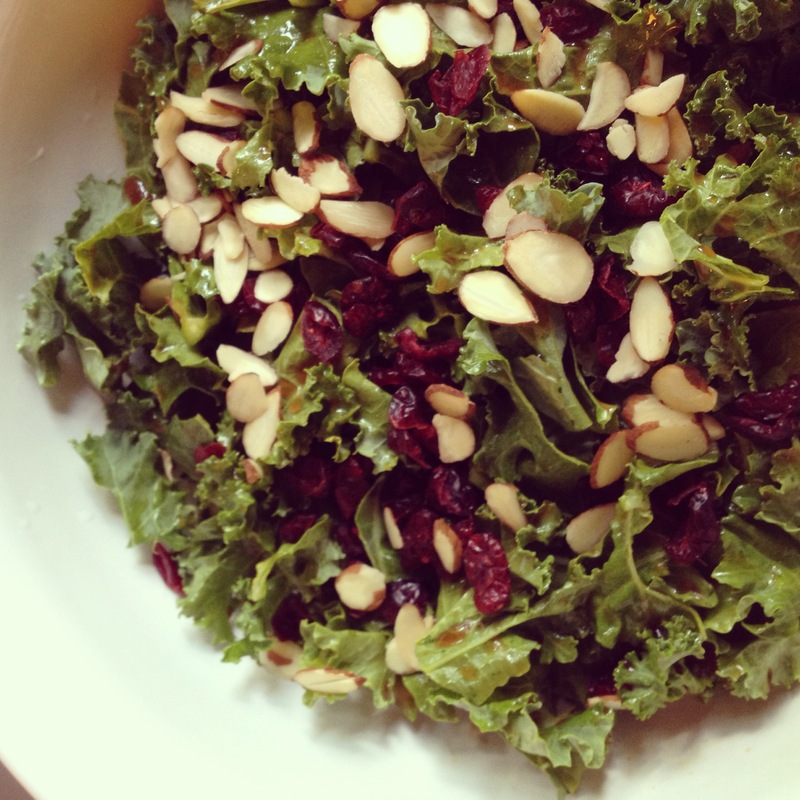 pour dressing over kale greens, add cranberries, and toss a bit. 3. you can serve immediately, or ideally, refrigerate and serve the next day so that the flavors really soak in and the kale absorbs the dressing and softens (if you can’t refrigerate overnight, let it sit in the fridge for at least an hour or two to soften the kale). while it’s marinating in the fridge, stir it a few times, every 3-4 hours if you can to redistribute the dressing. before serving, top with pepitas and almonds.